Last night we spent a very enjoyable evening at an outdoor concert. 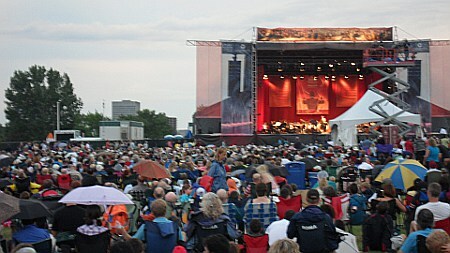 The NAC and other orchestras do a series of free concerts in the park in summer. 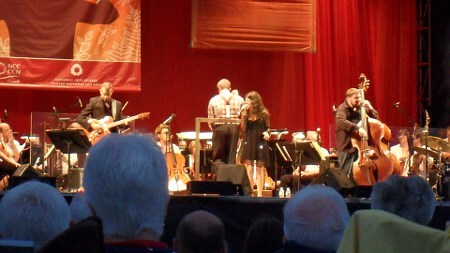 Last night’s featured Nikki Yanofsky, a sixteen year old singer from Montreal. We packed a picnic and lay out our blanket to enjoy the show. As we arrived 75 minutes before the concert we were able to sit near the white sound tent which put us in front of two thirds of the audience. The support artists, Time for Three were great, playing some familiar Stellae Boreales repertoire but with some interesting twists such as both violinists playing the same violin simultaneously. Nikki Yanofsky has an amazing singing voice which you wouldn’t expect to hear if you only heard her speak. As she chats to the audience she sounds like a sweet young girl, but as soon as the music starts she blows you away. For the girls it was their second concert of the day as they attended the Chamberfest Rising Stars concert where two Stellae Boreales members performed. This entry was posted in Music on July 25, 2010 by Heather.